There’s nothing more magnetic than an “outdoor room.” It’s more inviting than just a porch. It’s more romantic than a deck or a patio. It can be either snuggled against the house or set out at the edge of the property. Either way, it’s like a secret garden. People are drawn to outdoor rooms like bees to nectar. What are the components? 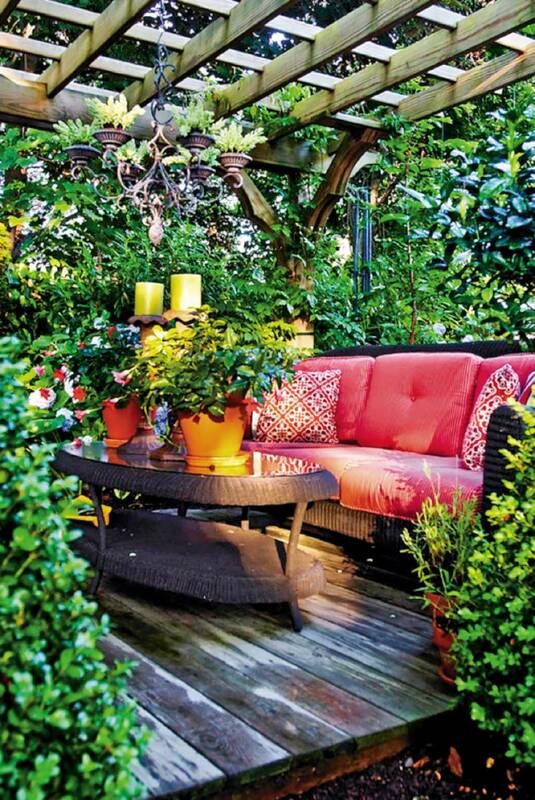 What do you need to turn the outdoor seating area into an actual room? Think living room — bring a little bit of that indoor comfort outside with elements you associate with a cozy home. Adding a rug is an easy design technique and will transform your space like nothing else. Fabric technologies have advanced to the point that durable, weather-resistant rugs are available at virtually every rug retailer, from Pottery Barn to Home Depot. You will find attractive, sturdy area rugs in all sizes. Some are even made from recycled plastics and can be hosed off, although you should be careful not to go for the brightly colored ones, which can look cheap. There’s nothing that says “room” like a pretty area rug under the coffee table or in front of the couch. Again, fabric companies (like Sunbrella) have advanced so far in their weather-resistant selections and cushion fills that choices now include velvets and other soft textures. 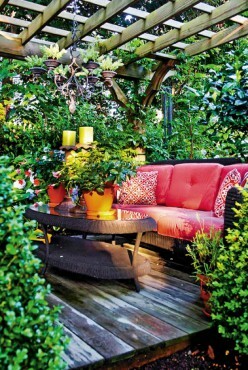 Outdoor seat cushions and back pillows feel cozy but dry quickly and are less likely to get moldy. Throw pillows are wonderful if your furniture is not upholstered (such as the legendary Adirondack chair). Just add a weather-resistant throw pillow or two for comfort. 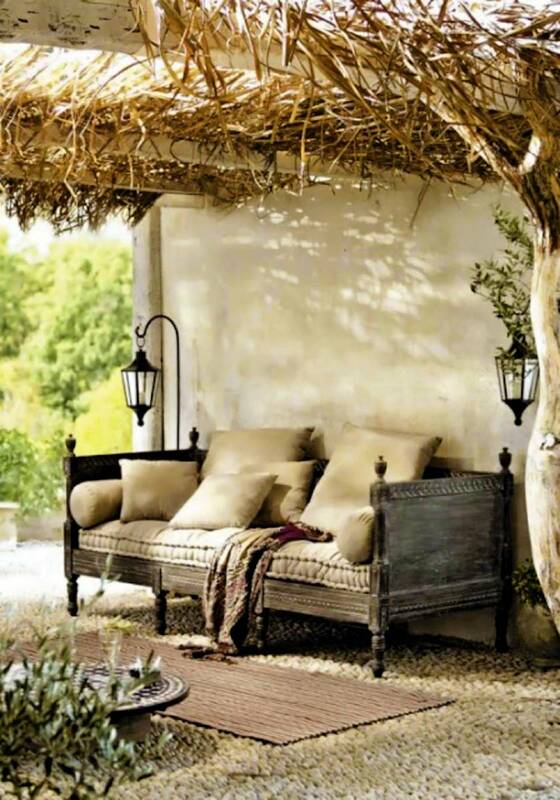 Yes, comfort is the key word in creating an outdoor room. Fabrics will make that happen. 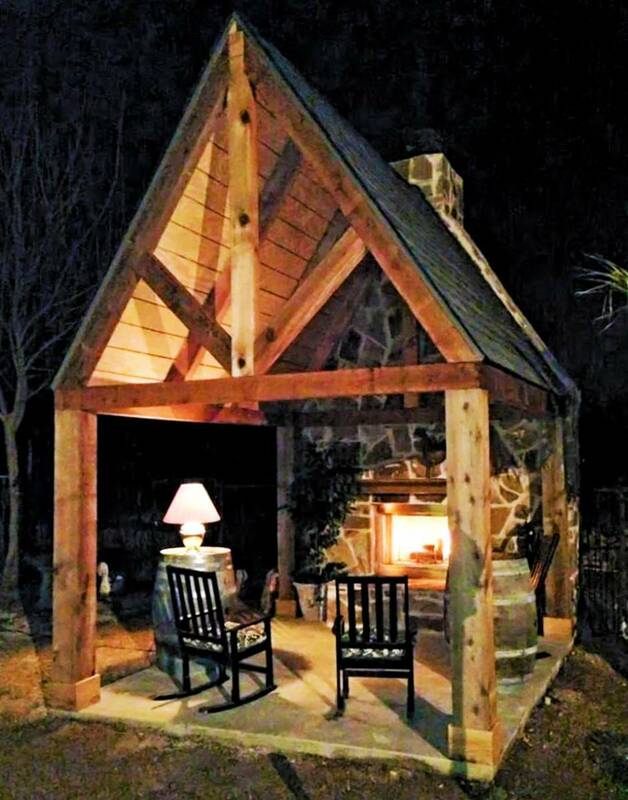 Suggest a ceiling with an overhead trellis or pergola. It’s not an actual ceiling, of course, but it does say “shelter” and “enclosure.” The idea is to let light and fresh air in while creating the illusion of a ceiling. 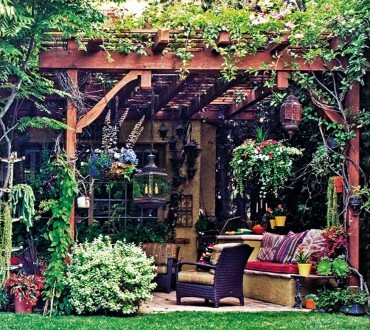 Have a carpenter build a pergola or gazebo with simple but sturdy posts and overhead cross beams. There are endless designs to copy on the internet or on Pinterest. The least expensive (about $200) outdoor room structure can be made with bamboo uprights cleverly set into large potted plants. This isn’t the strongest but can hold a light drape and create a lovely surrounding. Accessorize your outdoor room as you would an indoor room. Suggest a wall by draping fabric on the structure. It’s oh-so-dreamy! Stick with sheer or lightweight, outdoor fabric made to survive the weather. When the wind catches the cloth, it’s the most sensual experience ever. Another idea is to use a plant such as a lush and fragrant evergreen clematis vine that will get very full over a few years. It truly feels like you’re in a secret garden. Another way to “suggest a wall” is with a sheet of trellis material, fencing material or even an antique door such as a wide pair of French doors. Yes — use a door not as an opening, but as a wall. 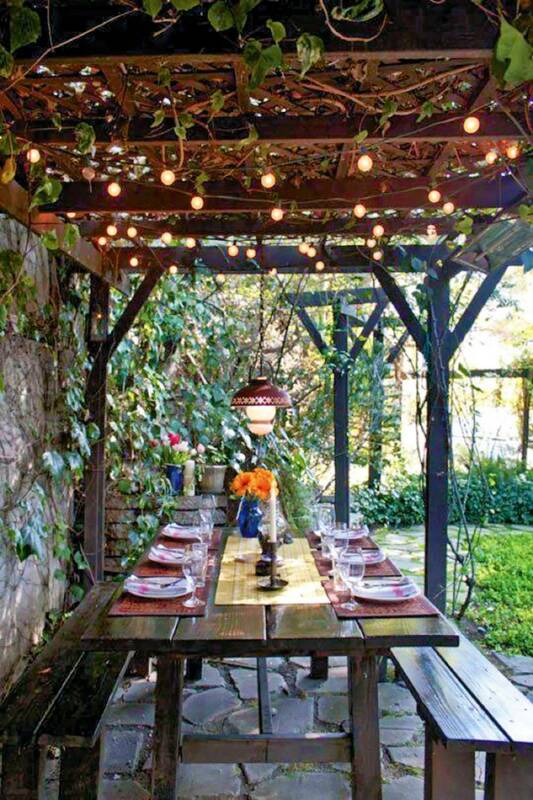 Hang plants and lanterns from your structure. Suspend bird feeders from the beams. 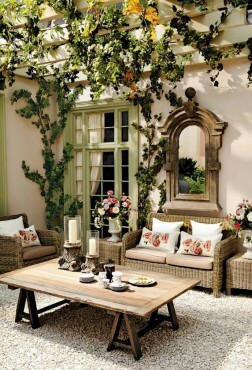 If your outdoor room has a solid wall, hang some art or a mirror to make it really feel room-like. Stringing lights above your head creates dramatic nighttime atmosphere, whether you’re sitting outside or just looking through the window from inside your home. Eye-level lighting is recommended, when possible. It’s the most practical and the most flattering lighting of all. So why not add a table lamp (if you can hide the cord so no one trips over it)? 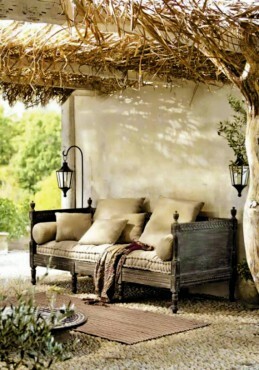 It may sound crazy but it’s actually a wonderfully inviting element for your outdoor room. A fireplace or a fire pit has no equal when it comes to creating atmosphere. 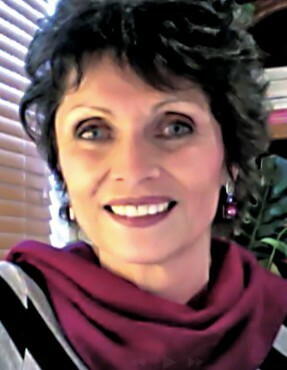 Perhaps the soft glow of fire releases endorphins, creating the feeling of peace and serenity. Of course, don’t forget candles. Several candles — no, many candles. And make sure to provide yourself and your guests with ways to stay warm, providing cozy blankets and throws. Comfort is of utmost importance. Is it more important than design? What do you think? What good is a beautiful room that is not comfortable? It’s fun eye candy but that’s not enough. We want to use it, don’t we? 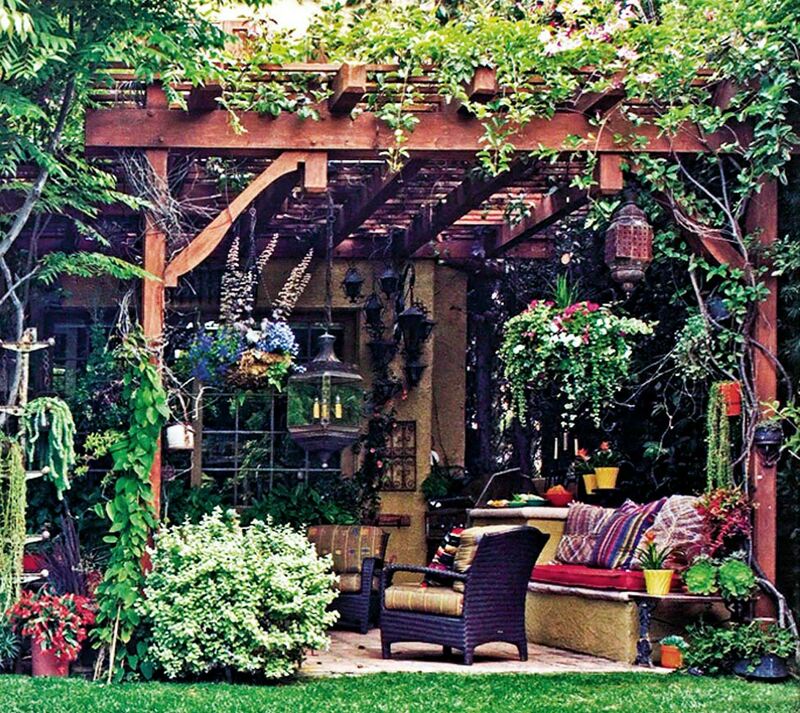 Whether you simply place a rug between two chairs or construct a pergola, consider creating an outdoor room this summer and watch your family swarm to it day and night.